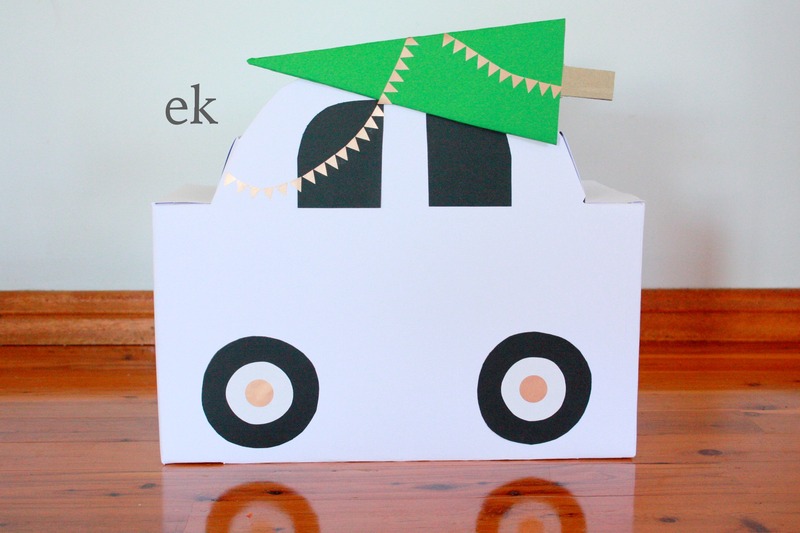 Thanks for your interest in our box vehicles and for your patience while waiting for this tutorial. 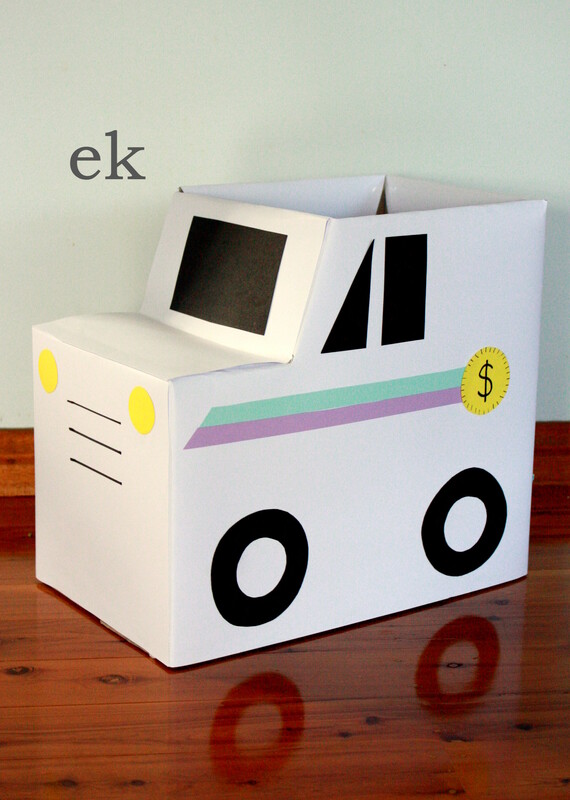 These larger trucks each use 1.5 nappy/diaper boxes, for cars using only one box see Part 1 – simple car. 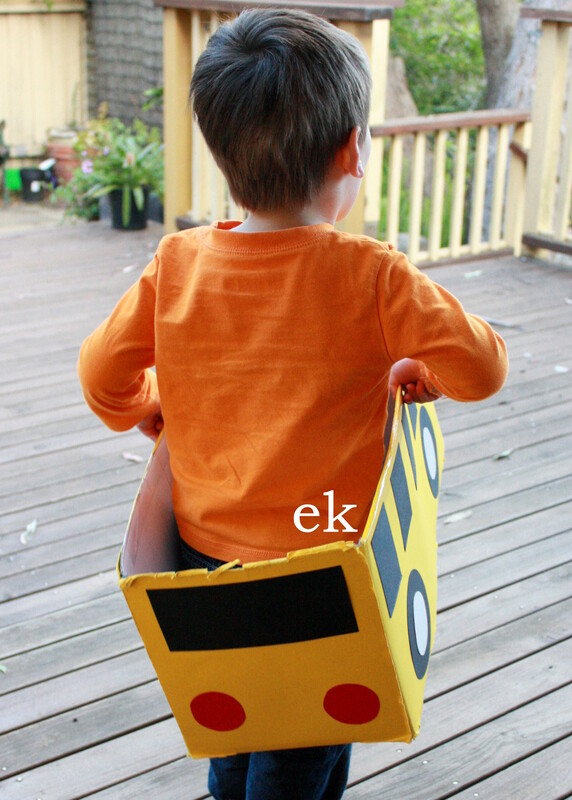 For dump truck ideas see here. 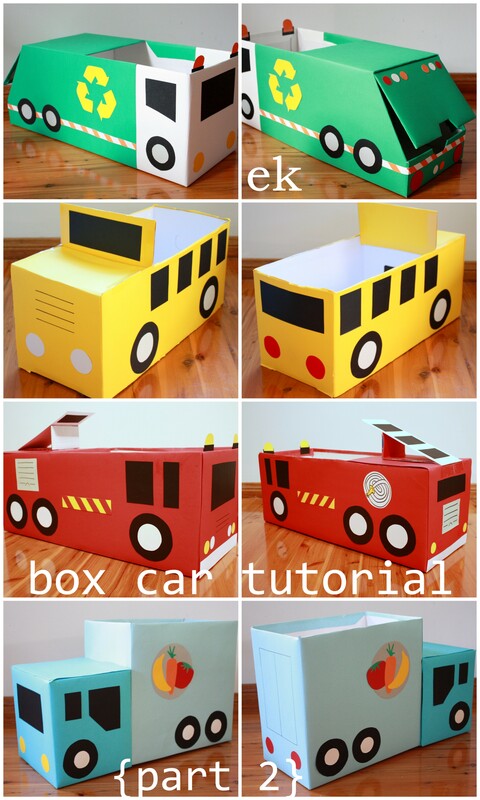 You could also make a larger truck using the same techniques from these tutorials out of a larger box, for example this large fire engine was made from a box approximately 150cm x 80cm x 80cm (60″ x 31.5″ x 31.5″). 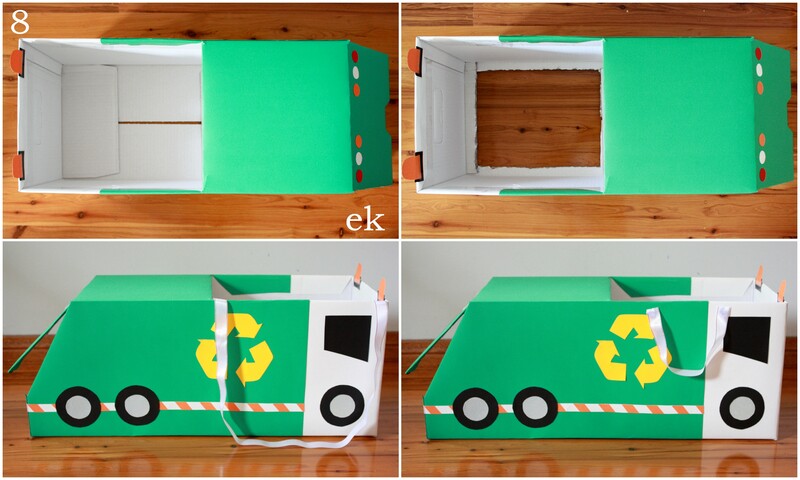 For the garbage truck, cut off the front and side flaps of the whole box and tape the back flap horizontally, this will create a larger top of the truck. 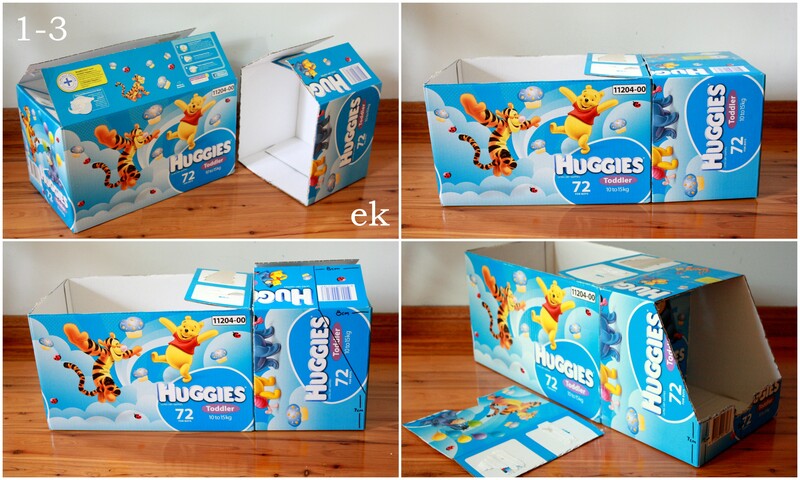 If this makes the box too small for your child to fit in, simply remove the back flap also. Cut the half box diagonally to create the hopper, leaving an edge at the top and an edge at the back. The measurements I used left an 11cm (just under 4.5 inches) edge at the top and 7cm (just over 2.5 inches) edge at the back, but vary these according to the size and shape of your box and the design you wish to have. I also cut out a small section of the back edge for interest. Keep the large piece of cut off cardboard if you wish to make a flap for the back. Trim it so the fold meets the top edge of the hopper with a large enough width to tape to the top inside of the hopper. I also cut out a small section in the middle at the bottom of this flap for interest. If you know you wish to remove the bottom of the box (see step #8), now is a good time to do it. 3. 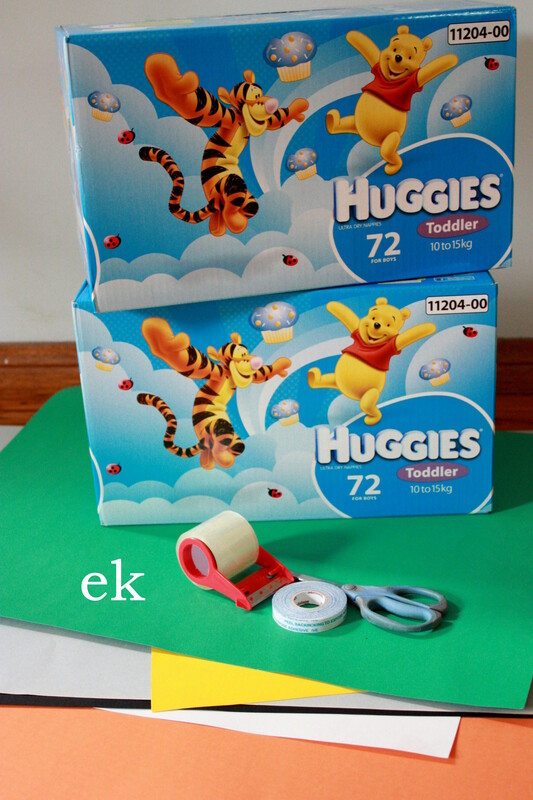 Attach the half box to the back of the whole box with packing tape (the flap will be attached in step #6). 4. Cover the cab of the garbage truck. I used white cardboard, leaving overhang, and attached it with packing tape. 5. Cover the sides of the garbage truck. 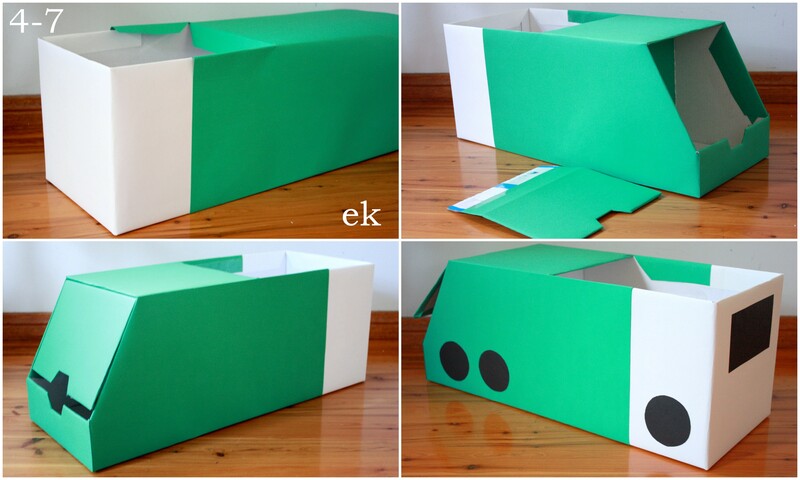 I used green cardboard with overhang and attached with packing tape. Where the green meets the white cab, I used double sided tape for a clean edge, however packing tape would be fine here too. Cover the flap, leaving overhang, and using packing tape. 6. Cover the top and back of the garbage truck. I like to cut the cardboard to size and attach with double sided tape, however packing tape would be fine here too. Attach the flap to the inside of the hopper so that the fold is at the top edge. 7. Decorate the garbage truck. I have added wheels, windows, safety stripe, safety lights, headlights, break lights and a recycling symbol. The complexity is completely up to you. You could add a steering wheel, doors, grille, wing mirrors and so on. The title photo of this tutorial gives some inspiration for adding details to make different types of trucks. 8. If your truck is for stuffed animal friends or if you are keen to push your little one around, you could leave the bottom of the box intact. If your child is older and will run around in the box, cut out the bottom for them to stand in. 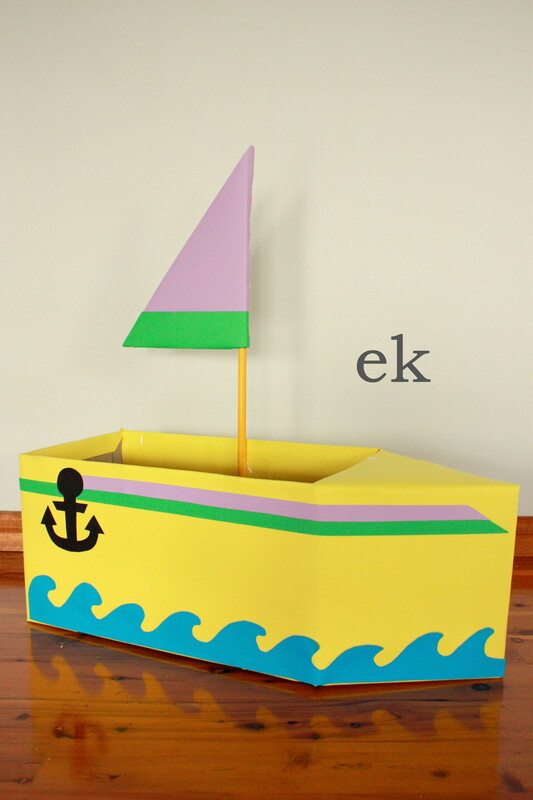 I leave mine like this and the little man holds the box itself but you could add either handles or straps by making holes in the sides and attaching string or ribbon. Please let me know if there is anything that could be clearer or if you have other questions. Click the photos below to see other designs in our box vehicle fleet. Thank you so much for this tutorial. 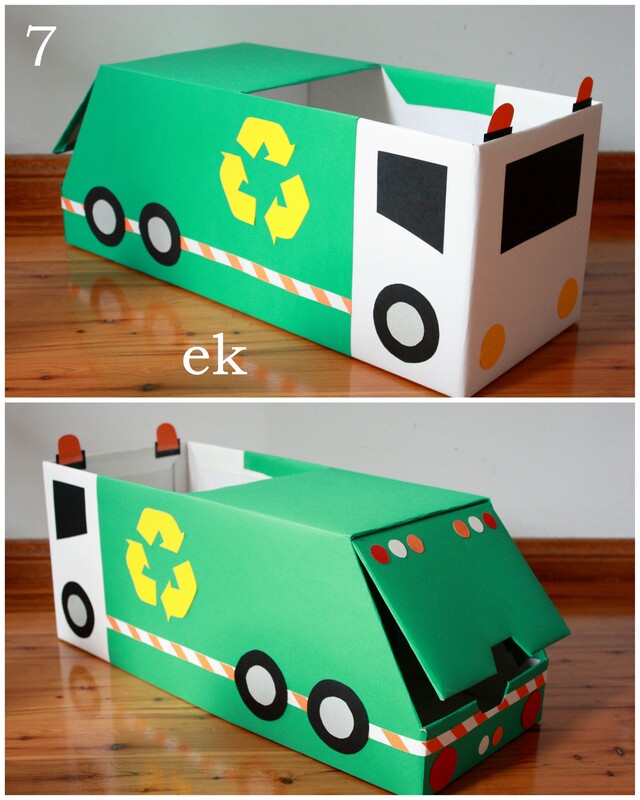 I am a kindergarten teacher looking for how to make a garbage and recycling truck for my drama centre at minimal cost and here you are. Thank you!!!! Greatly appreciated. Thank you so much for explain how you did this. I made the bus, recycle truck, and delivery truck for my son’s 2nd birthday party. The kids loved them! I also made some smaller versions for centerpieces. Again, many thanks! sorry to ask the stupid question but please could you let me know where to find the complete tutorial for BUS please? Hi. Not sure if you still check this. But just found your site and love these cars. My son wants to be an ambulance for Halloween and I’m searching for tutorials. Do you have one for the ambulance? Thanks for your time. Toy storage is a great idea, how fun! These are very creative and I am sure the kids in my class will enjoy making some of these. Thank you so much. These are so fun!!! May I ask how you made the moving bulldozer part in the front? Ohhhh right! I know the faster you mean, I totally forgot about those things. That makes a sense so it can move. Awesome! I’m going to attempt the bus first on the weekend. Haha. My son should love it! Thanks! I made a firetruck and recycling truck for my twins for Christmas. Best gift ever. They have been playing with them for 2 days straight! Thank you for the inspiration! Hi. Unfortunately I have never made a roller, but it sounds like a fun project. The closest thing I have made is probably the bulldozer, perhaps you could substitute a cylinder roller in place of the bulldozer blade?